Without plug-ins, the THETA V can record video for only 25 minutes. With plug-in technology, I recorded a 4K video with 4-channel spatial audio that was longer than 48 minutes. 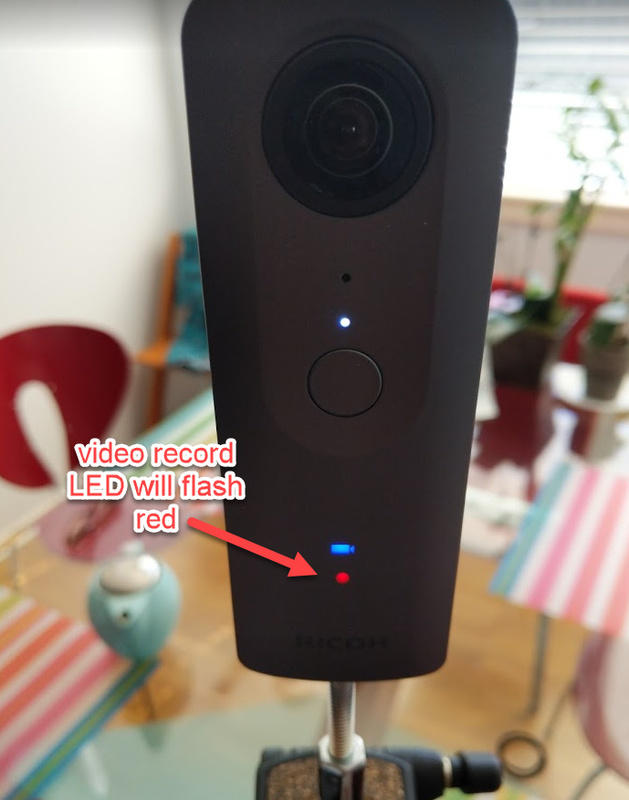 Specifications on the main THETA V product page on the Ricoh site indicate max record time per video of 25 minutes. We can get around this limit. 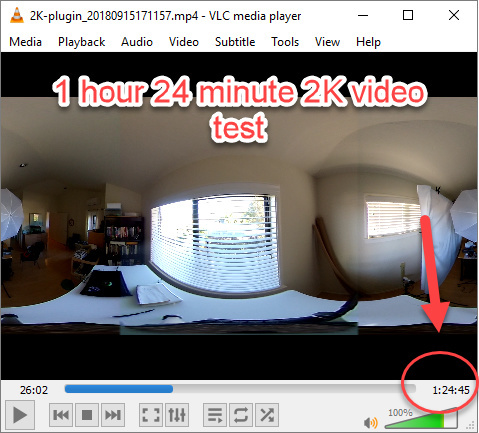 My 48 minute 29 second video test resulted in a 19 GB MP4 file saved to the THETA internal storage with a resolution of 3840x1920. 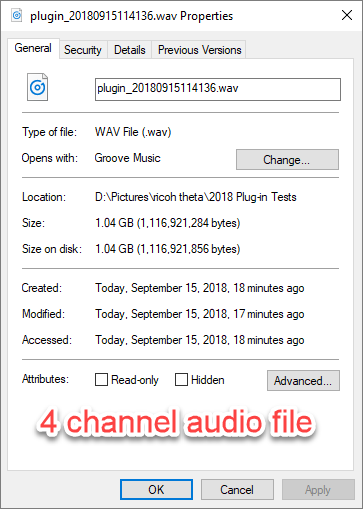 A companion .wav file with 4 channel audio was 1.04 GB. 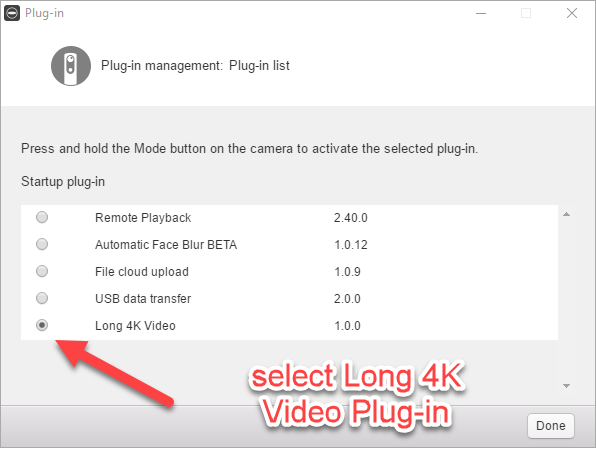 The plug-in will automatically stop the video when it reaches 19GB. 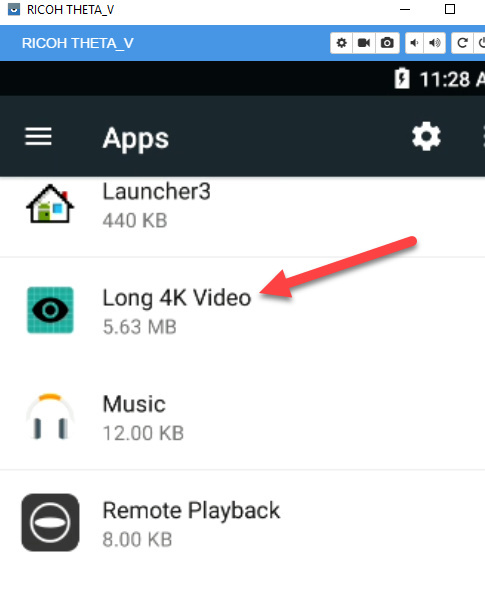 Use the official Ricoh or mobile app to set Long 4K Video to launch. Press the lower mode button for 2 seconds. The white LED light on the front will turn on. Press the main shutter button. The red record button will blink. 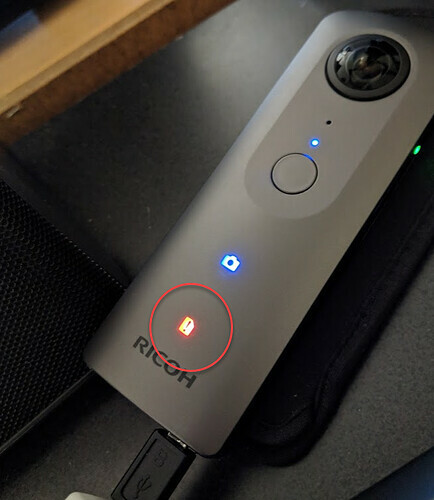 If you fill up the entire 19 GB storage of your THETA V, you will see a red storage LED. In my tests, this was fine and I had no problem. The red storage LED went away after I deleted the large file from my camera. I’ve only tested this on Windows 10. 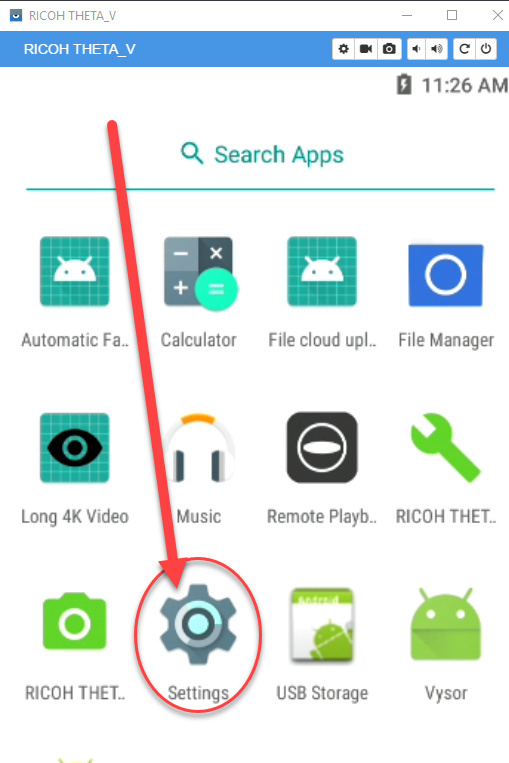 Connect the THETA V to your computer and drag and drop the video file onto your computer. When I started the transfer to my Windows 10 desktop, I saw some large times remaining. You can ignore this as the the time was not accurate. It takes about 5 minutes, not 1 hour 20 minutes. Camera back to normal after I transferred the 17 to 19 GB files to my computer and deleted them from the camera. video will fill entire 19 GB storage of internal camera storage. 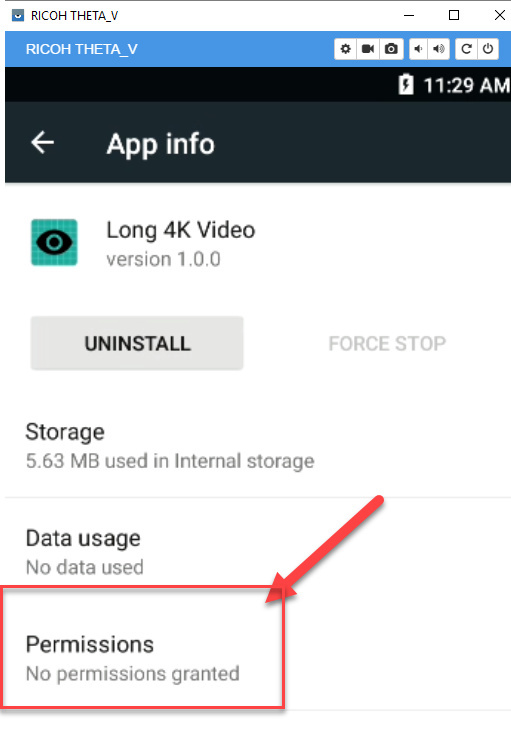 To get the longest video possible, delete the existing files from your camera before starting the video recording session. to combine the Ambisonics audio and video, read this tutorial from Adobe on using Premiere Pro to assemble the audio and video for your immersive experience. 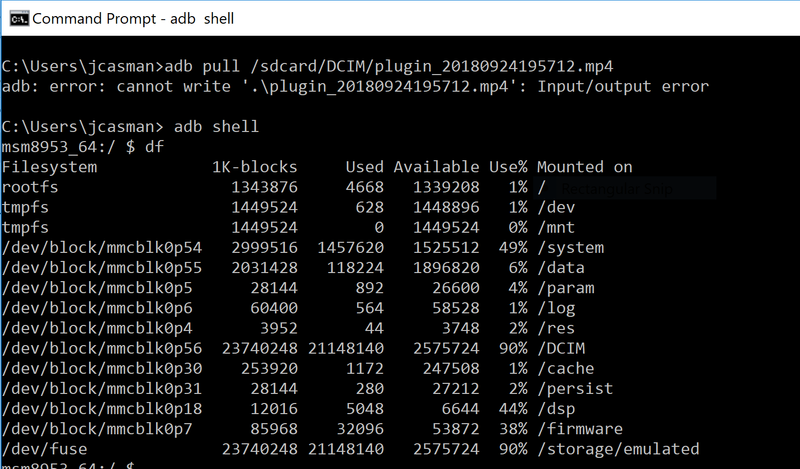 You may need to use adb to delete old audio files. See this article. video is 4K. 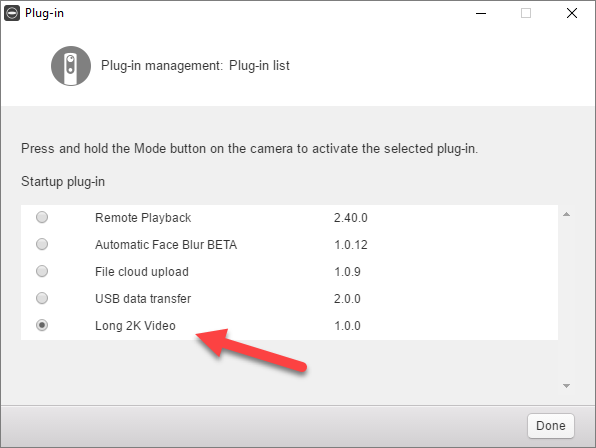 There is another plug-in that records 2K video. resolution can be changed in the code. video is stitched in the camera to output equirectangular. 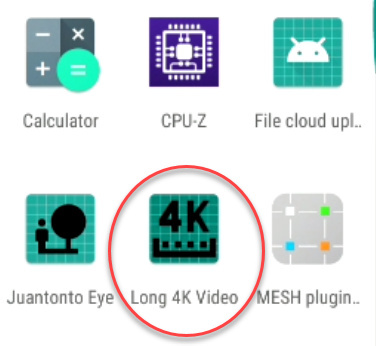 can be changed in the code to record dual-fisheye video inside the camera. You must register your camera with the partner program to put it into developer mode. Start the process of signing up for the partner program here. Information on checking and updating the firmware is here. 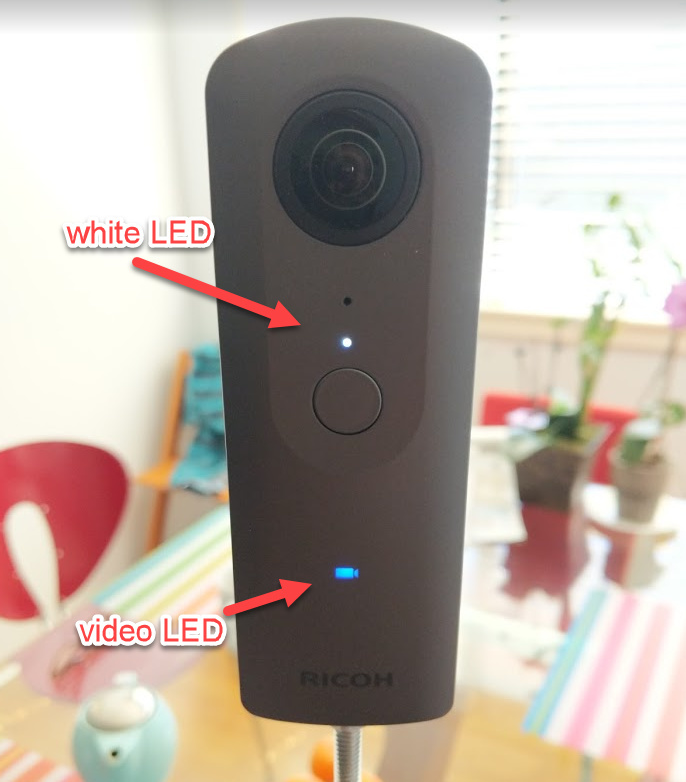 From the Ricoh site, it appears that the internal storage capacity of the camera will limit maximum video length. As this is a developer version of the plug-in, you will need to use Vysor to set the permissions. This is a one-time configuration that you need to do each time you install a new version of the plug-in. If you’re a developer and are part of the partner program, you can go to the next section and install the plug-in from the GitHub repository. If you’re not ready to compile the source code with Android Studio, @jcasman will work out a way to help you. Drop us a note below and he’ll contact you. sign up for the partner program. It’s free. It’s a long set of steps, so we’d like to help. You can also send @jcasman a DM. 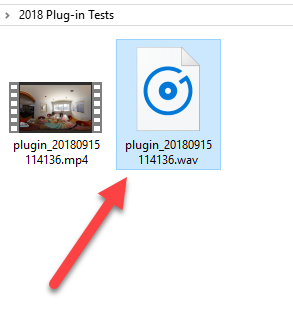 The audio file name is plugin_20180915114136.wav. The only difference is the .wav extension. You now have both the audio and video files. You’ll need to use a tool like Premiere Pro to assemble the files. Delete the audio file from your camera. THETA Sample Plug-in: CameraAPI Capture Plugin. Contribute to theta360developers/theta-plugin-camera-api-sample development by creating an account on GitHub. Captures still and video by using Camera API, AudioManager API and PluginLibrary for RICOH THETA V.
After capturing still or video, the JPEG or MP4+WAV file is stored in /sdcard/DCIM/ folder. The stored file name is “yyyyMMddHHmmss”.jpg (.mp4 or .wav for video). “yyyyMMddHHmmss” is 20180123123456 when it is 12:34:56 Jan 23, 2018. WebAPI can not be used when Camera API is used. The .wav file includes 4ch spatial audio as a first-order ambisonics B-format. 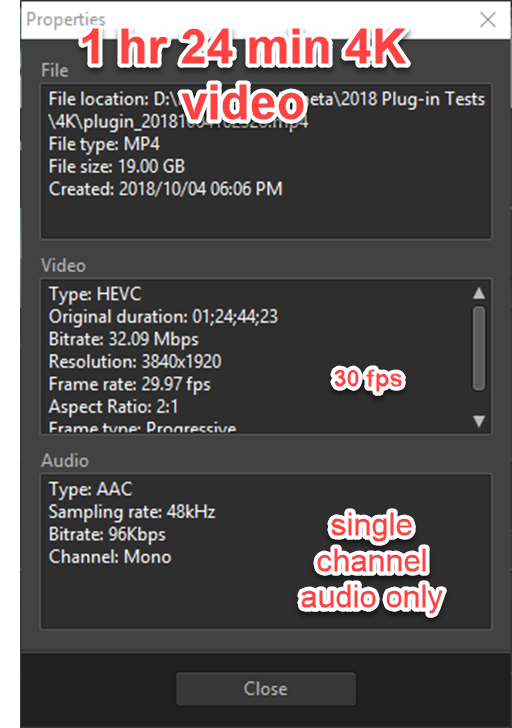 The .mp4 file includes 4K video and 1ch monaural audio. I am still experimenting with different bitrate and framerates. Check back for progress in the future. 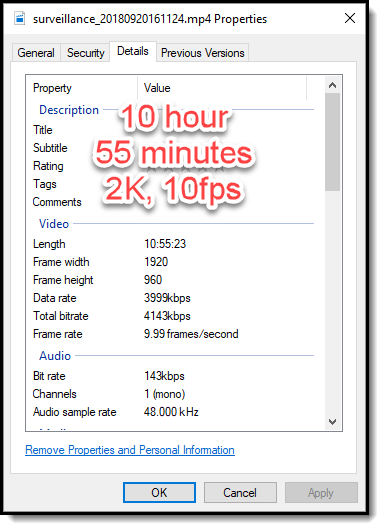 Current tests can record 19 hours 55 minutes of 2K surveillance video at 10fps. I’ll post a short test clip soon so people can see the quality. I worked with the Long 4K Video plug-in over the weekend. I like it a lot, it’s quite easy to install and use. I did several short tests starting and stopping the video. 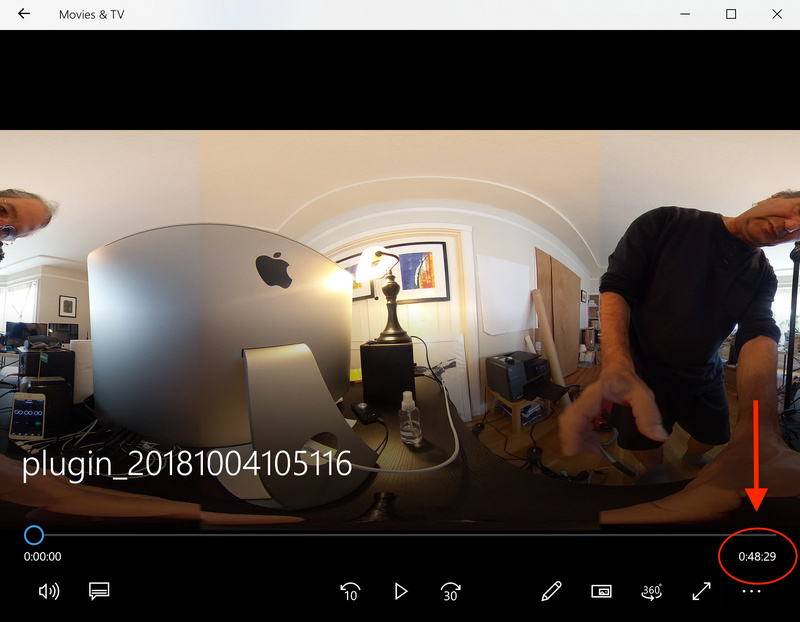 And I’ve done one longer test - 30 minutes and 7 seconds which made a 11.8GB file on my THETA - and I intend to be testing more soon. That’s 10 times longer than any THETA video I’ve done before, so it was a pretty cool result already! Don’t forget to set permissions for the newly installed apk using Vysor. If you don’t, when you go into Plug-in Mode (white LED) it will triple beep and flash a red LED as if the plug-in is crashing. I don’t know understand the discrepancy. But the information here in this post by @codetricity is correct. 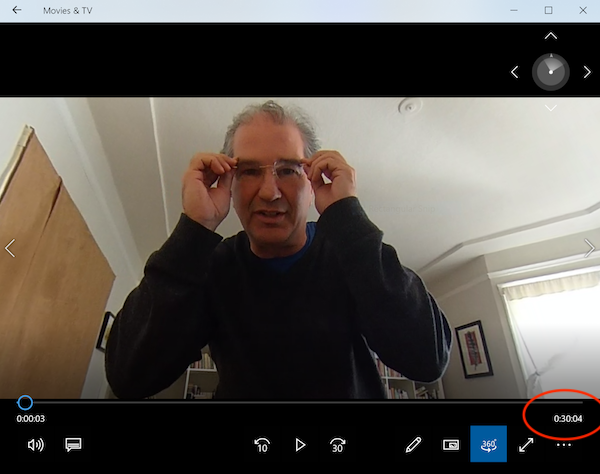 For me, connecting with the THETA and managing the longer video files - moving them over to my PC, copying from or deleting on my THETA - in my experience takes a little bit of effort. 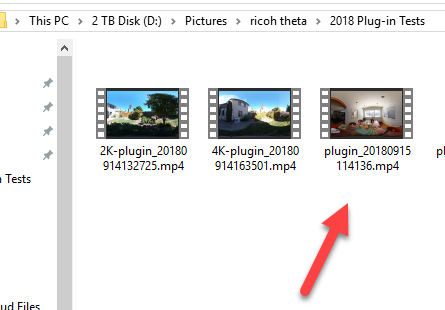 The section in this post called “Transfer Large Files from Camera to Computer” has good details and shouldn’t be skipped over. I did all my testing on a Windows machine. 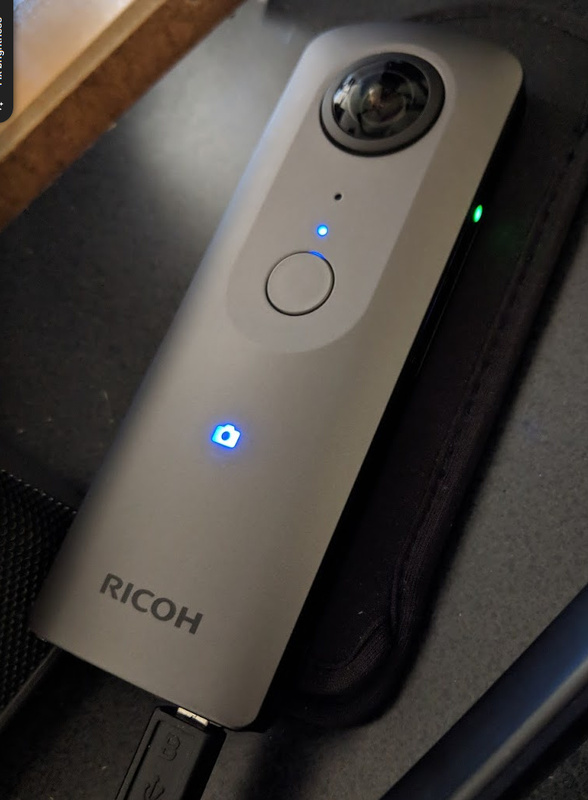 When you connect to your THETA, you can get better information then when you’re on a Mac on things like THETA battery level, firmware version, and lots more. I’m basically a Mac guy, but in this case Windows appears to have quite a few advantages. sdcard is a symbolic link, but I believe it functions on camera. Still testing this. 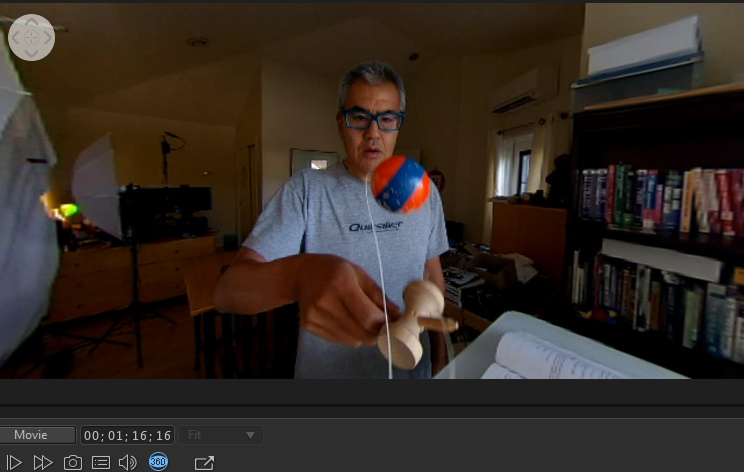 The plug-in is stable and I still like the the ability to do longer videos. But I’d like to post one issue that I’m having that might be common. If you overdo it, and fill the memory of the THETA, I can’t seem to get the video off the camera. 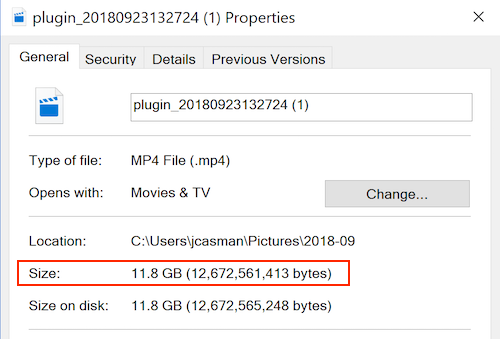 Here I’ve recorded a video for about 50 minutes and the .mp4 video file appears to be over the amount available in memory: 20402573030 bytes or over 20GB. Note there are 2 files, a .mp4 and a .wav. 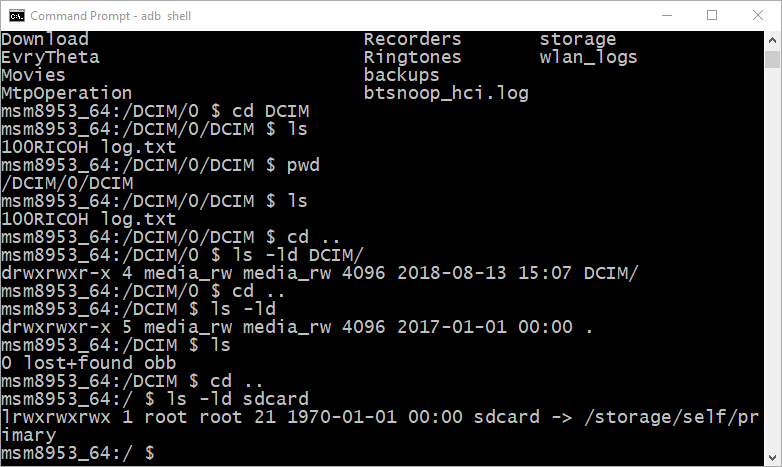 And then below in the next screenshot is the I/O error I get when trying to do an adb pull to get the files off the camera. Trying to use Windows programs (File Explorer or Movies & TV) which work for smaller videos files also fails. I’ve done a df to show the amount of available disk space as well. I believe this is due to the combined filed being over 19GB. The plug-in will stop after the video file reaches 19GB. Due to the size of the WAV file, it is exceeding the capacity. I think an easy fix will be to set the max video size to 18GB instead of 19GB and see if it fits on the camera. 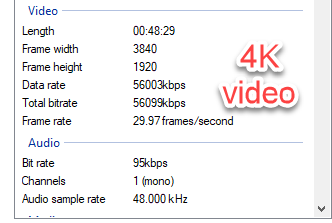 In addition, I have a version that saves the video into HEVC format, which has better compression than H.264. You screenshot is helpful because I can see the max size of the WAV file. I’m going to make the two changes above, both for the encoding and the max file size, then I’ll run another test. Camera overheated after 18 minutes of HEVC recording to file. Note: camera was lying down on my desk for the test and resting on the foam case with zero airflow. 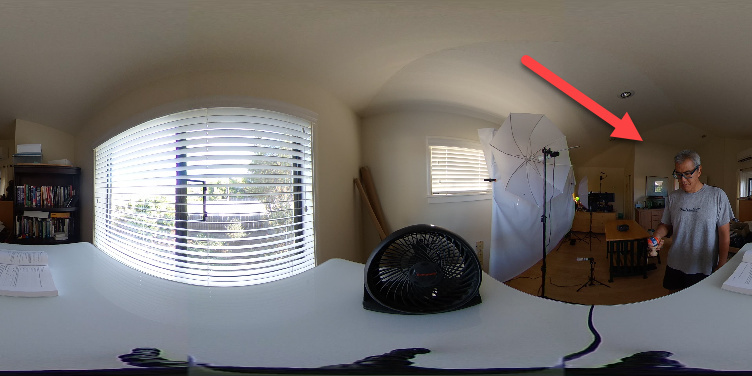 I am going to redo the test with the camera in a tripod and provide some airflow to the camera. H.265/HEVC is a cutting-edge, high-efficiency video codec that's particularly useful for streaming 4K video. 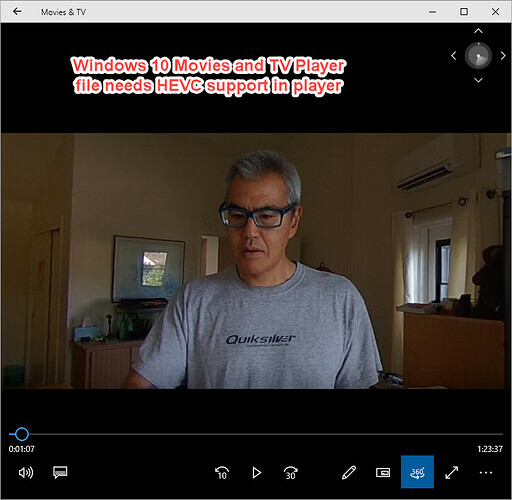 Here's how you can play back HEVC on your PC. 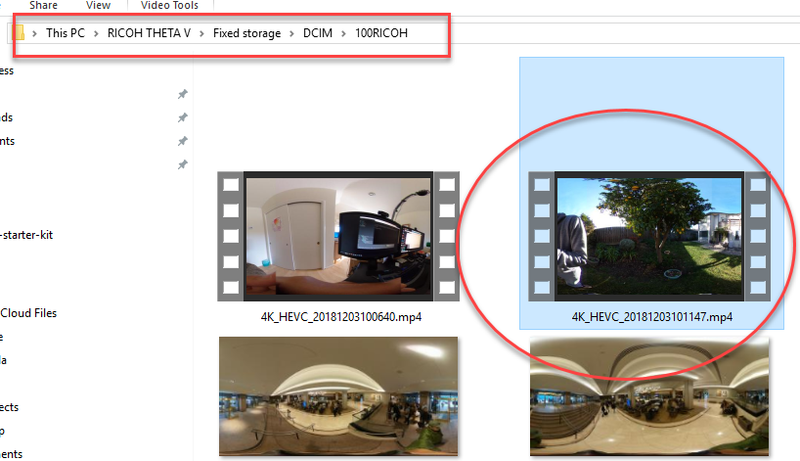 It looks like HEVC is putting much higher load on the camera MCU. Higher efficiency usually comes with a cost: complexity. H.265 is far more difficult to encode as a result of its complexity, and can require up to 10 times the compute power to encode at the same speed as H.264. I also changed the icon as well as the application name and package name. When you set the permissions, look for the application below. I tied the record! I guess without changing any settings, 48 minutes and 29 seconds is the longest video you can record. And here’s the completed adb pull with no I/O error. Didn’t break the record but it’s progress for me! How did you get the exact same video length that I did? Did the file just fill up the 19GB of storage and then stop? If so, why were you having a problem before? I wasn’t able to get a longer video with HEVC in my first test. This leads me to think that something is wrong. Maybe it’s not actually saving it as HEVC? 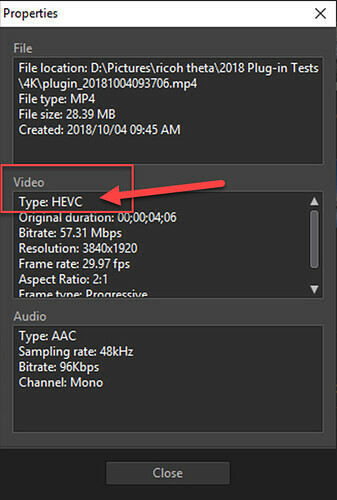 How would it be possible for the file to say that it is HEVC, but not actually be HEVC? I’m going to try and record with single channel audio only. If I don’t save the spatial audio WAV file to the camera, I should be able to get a longer recording. I’m not have any problems transferring the files to Windows 10. If you’re having problems, maybe try a different USB cable? 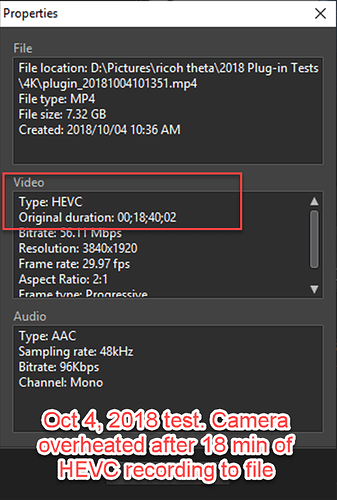 With a shorter test clip, I compared the file size of HEVC and H.264. Though the encoding is different, the file size is roughly the same. It’s not clear to me how this is possible. I would expect the H.265 file to be smaller than the H.264. I was able to get longer videos stored internal to the camera without a loss in video quality. Framerate and resolution are identical to default camera app. No noticeable artifacts. The following are zoomed in portions of the equirectangular image. 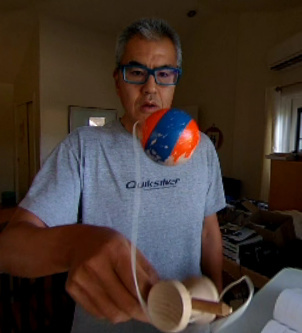 Object is a wooden ball moving quickly. After discussions with @jcasman about VP9, I looked into support for that video encoding standard. 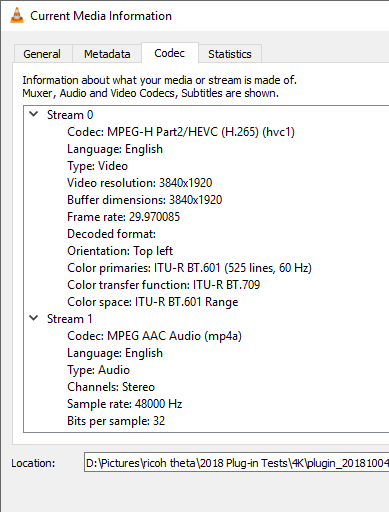 Unfortunately, it doesn’t appear to be supported by the Android MediaRecorder.VideoEncoder. I’m in the process of submitting the long video plug-in to the THETA plug-in store. The process may take a while. I’ll share the apk I submitted here. I’m also working on end-user documentation. 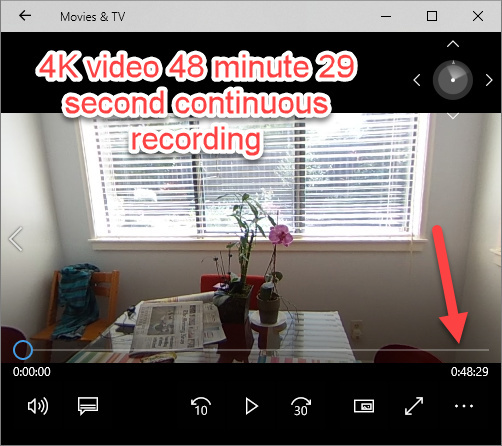 Records 4K video with a maximum length of 1 hour 24 minutes. 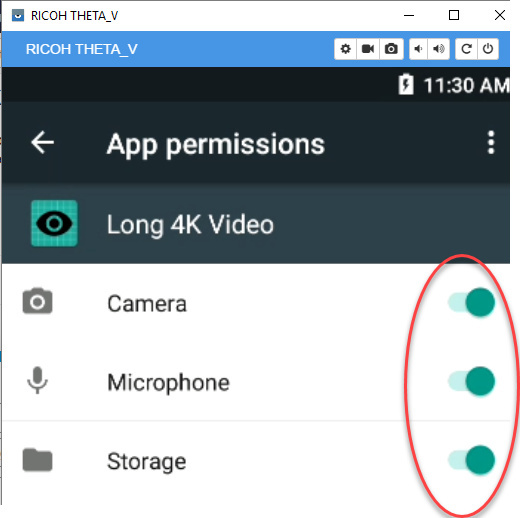 It overcomes the 25 minute video limitation of the standard THETA V.
Uses close to full internal storage of THETA V. Set to limit at 19GB per video file. No spatial audio. The code can be modified to save a 4ch spatial audio .wav file with first-order ambisonics B-format. The spatial audio file is not saved by default to avoid people having to delete the file. Heat. I have not tested this fully, but the camera does seem to get hotter. You may need to blow a fan on the outside of the camera body. Or, use it in the winter only. Not all video players support HEVC. This is a new compression standard and a new frontier. metadata is stripped out of the file. You may need to inject the metadata using a tool after your shoot. Instructions are below. To view the video on Windows 10 Movies and TV Player, you must add HEVC support to the player. 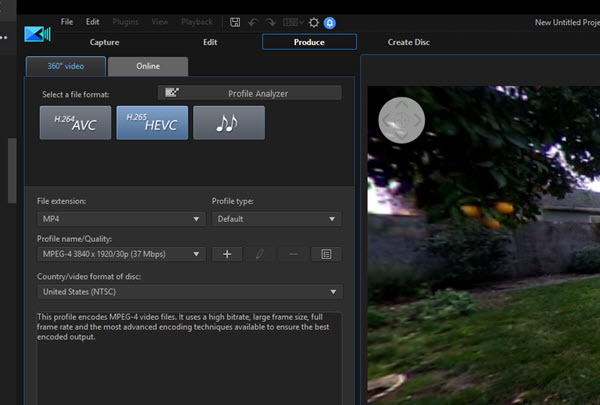 Both Premiere Pro and CyberLink PowerDirector 17 can handle HEVC. 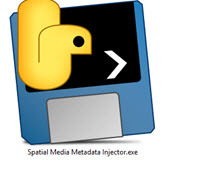 You may need to inject the metadata into the video file with Spatial Media Metadata Injector. Install the binary file with the link above. Pre-built applications are available for Mac and Windows. Save the file with metadata injected with a new filename. 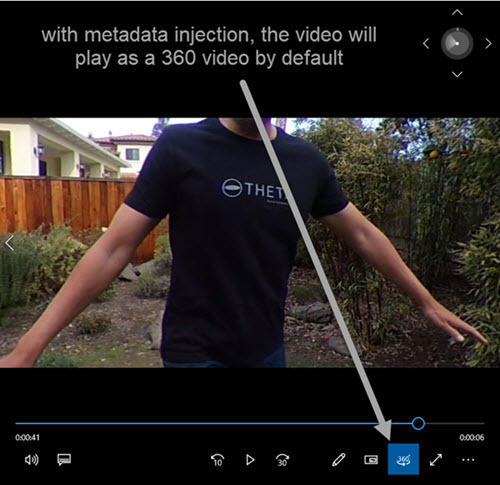 Use the new video file with injected metadata in your applications and on YouTube/Facebook. 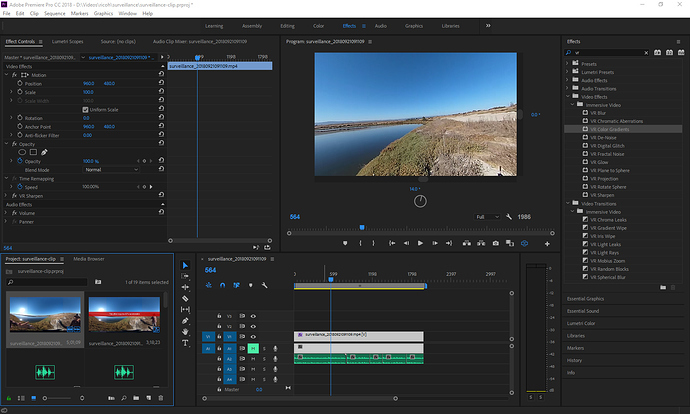 Both Premiere Pro and PowerDirector support HEVC 360° video editing. You do not need to export to H.265 HEVC. You can export with any encoding. However, if you want to keep the encoding the same, CyberLink does support HEVC format output, which will give you a smaller file size than H.264. 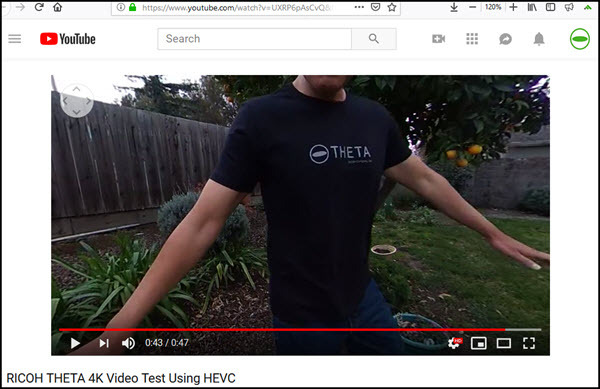 After injecting the metadata, you can upload the HEVC file directly to YouTube and YouTube. 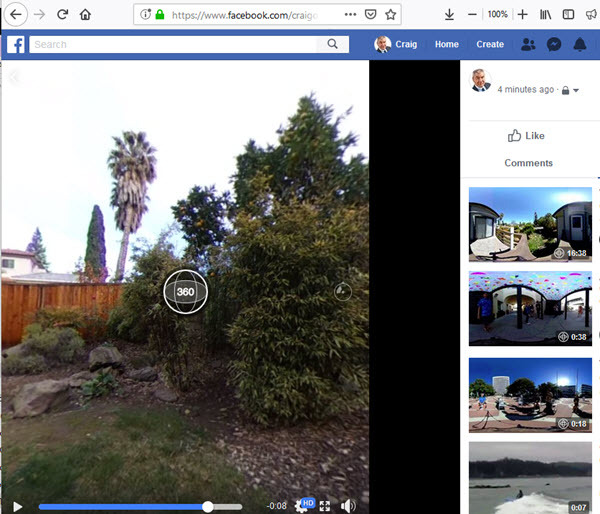 With the metadata, it will automatically be detected as a 360° video. I really need to get also the spatial audio Ambix WAV file. 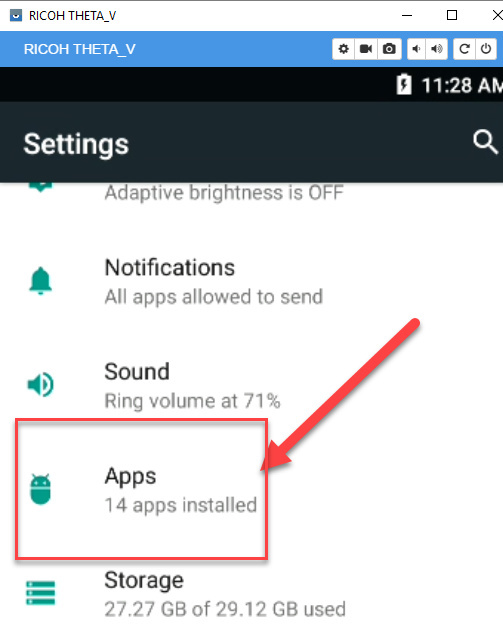 Any chance you post here the APK with that feature enabled? The .wav file includes 4ch spatial audio as a first-order ambisonics B-format. Is that the same as Ambix? If that format works, you will need to combine it with the MP4 yourself with third-party software, which I think you have. Do you want 4K video or 2K? 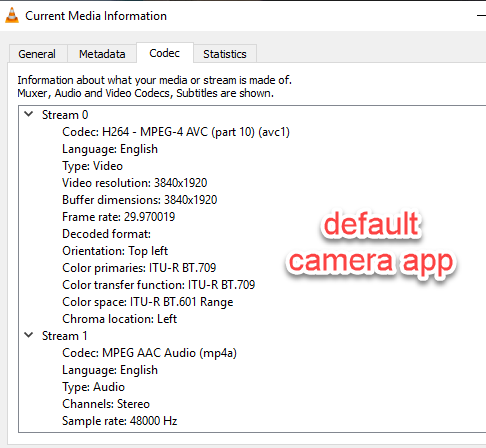 Do you want HEVC codec or H.264? Or both? (no problem, but it will be in separate plug-ins as it would take more time to set up some type of interface to change the settings). 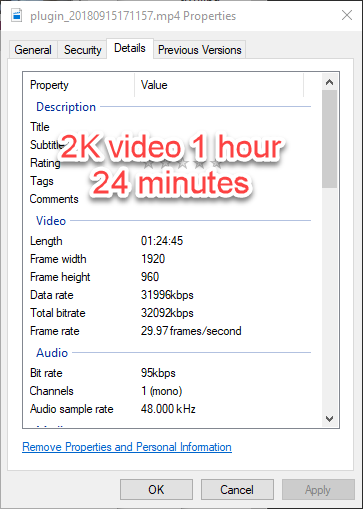 The max time with H.264 is 48 minutes unless I lower the bitrate encoding and possibly compromise resolution, though I haven’t tested the impact. Also, happy holidays. I’m taking some vacation time and it may take a bit of time get things configured. There are two formats for Ambisonics B-format 1st order (4 channels), named FuMa (Furse-Malham) and Ambix. They differ for channel order and amplitude scaling. FuMa is older. The channel order was WXYZ, and the amplitude of W(omni) was reduced by 3 dB in comparison of the amplitudes of the three figure-of-8 channels XYZ. Ambix is the newer Ambisonics format, supported by Youtube, Facebook and Vimeo. The channel order is now WYZX, and the gain is the same for all channels. So currently better to save Ambix, FuMa is deprecated. So please, save Ambix or A-fornat. Bye, and Merry Christmas to everyone! does not have HEVC and thus can only take a maximum of 48 minutes of video. 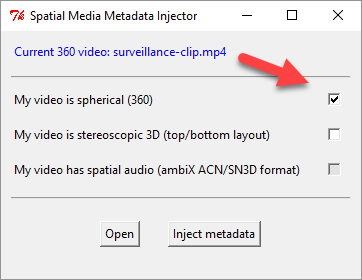 There is no metadata on the video, so you must inject it. 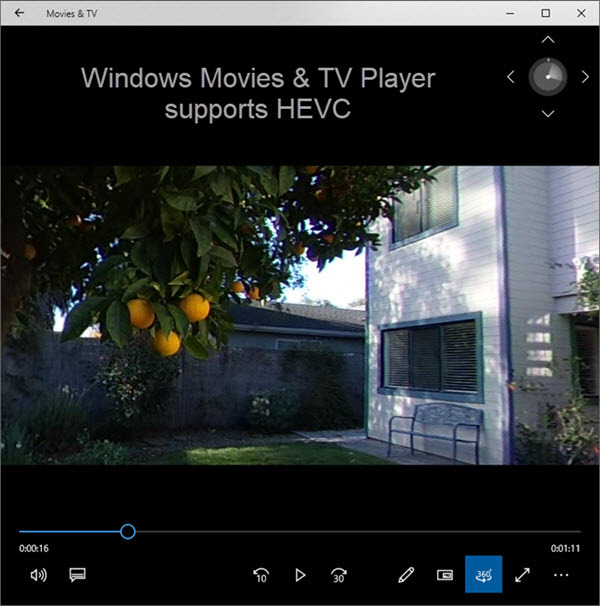 HEVC version to the store. Can save up to 1 hour 24 minutes. Will add some type of UI for audio and bitrate settings.